If you feel like spending some time this weekend reading about Vikings (and who wouldn't), have a look at a piece I wrote for the BBC History website about the thirteenth-century romance Havelok the Dane. As I hope I managed to convey in the article, Havelok is a thoroughly loveable poem. It comprised a whole chapter in my thesis, so I'm naturally fond of it! It was underrated for a long time; some of the early scholarship on it is breathtaking in its snobbery, littered with words like 'rough' and 'naive' and 'bourgeois' (fortunately things are mostly better now). It's true, Havelok is not the most learned poem; it doesn't name-drop Dante or paraphrase Petrarch, not even once. But it's full of energy, wit and heart, and it tells a good story with a sure hand. It has a strong care for social justice and for right and wrong (not a 'naive' care, unless to have such principles is automatically naive), but it doesn't take itself too seriously; it draws the reader into a fun community of listeners enjoying a story together, even when read on the page. Although it's about a displaced prince and princess and places great importance on royal blood, it's the least snobbish of romances: it finds value and meaning in the ordinary day-to-day labour of fishermen and cooks and handymen, and its hero is shown to merit his eventual happy ending not just through his royal descent but because of his willingness to do an honest day's work, to treat everyone equally, and to make a friend of anyone he meets. And its hero and heroine are perhaps the most mutually supportive and tender couple in medieval romance - give me Havelok and Goldeburu over Lancelot and Guinevere any day! All this is very appealing, and Havelok has the extra charm of being an interesting take on English, or more accurately Anglo-Danish, history, as seen from the perspective of Lincolnshire and the north-east. It gives a romantic origin-story to the town of Grimsby, about as unromantic a place as one could imagine - and why not? I was very pleased to see that among the people who shared the link to my piece on Twitter, there were some Grimsby residents saying 'That's how my town got its name!' - which is exactly what the poet would have wanted them to say. Perhaps it's no surprise that a story which weaves a romance out of the history of Grimsby should have suffered from academic snobbery (funny story: I wrote this BBC piece shortly after an occasion on which I presented on Havelok in a job interview, to withering scorn from the professor on the other side of the table. I didn't present especially well (withering scorn tends to impair one's performance) but I've since wondered if it was not just me but Havelok this man thought so far beneath his contempt!). But if liking Havelok is naive, I don't want to be sophisticated. You can read the whole poem here, in Middle English but with a handy gloss. To give you a taste, here's a characteristic extract, which illustrates something of the poem's best qualities, including its lively dialogue, its fast narrative pace, and its fondness for invective against the wicked villains. This passage comes when the usurper Godrich, who has seized the English princess Goldeboru's rightful inheritance, decides to get her out of his way by marrying her off to Havelok, whom he believes to be a common kitchen-boy (but is actually the heir to the throne of Denmark.) This is a serious moment in the poem - Goldeboru is being very badly treated, and the poem's full of sympathy for her, with a poignant little moment in which she reflects that such unwilling marriages are often a woman's lot. But it's tinged with humour, too, in Havelok's childishly innocent reaction 'What would I do with a wife?' and even in Godrich's naked villainy - he's practically cackling in his evilness here. Yes, it's OTT, but the poem is enjoying the excess, the sheer narrative pleasure of seeing our heroes in danger when we know it's all going to be OK in the end. And saide, "Maister, wilte wif?" "Nay," quoth Havelok, "bi my lif! Hwat sholde ich with wif do? I ne may hire fede ne clothe ne sho. Wider sholde ich wimman bringe? Ne cloth but of an hold whit covel. Aren the kokes and ich his knave!" Or I shal thristen uth thin heie." And grauntede him al that he bad. And ther thou shalt in a fir brenne." Formede hire wimman to be born. And said, "Boy, do you want a wife?" "No!" said Havelok, "by my life!" What would I do with a wife? I couldn't give her food or clothes or shoes. Where would I take a woman? I don't have anything at all! Or clothes except an old white cloak. Are the cook's, and I'm his servant!" Or I'll thrust out your eye!" And promised all that he demanded. And there burn in a fire!" And did not dare prevent the marriage. Caused her to be born a woman. He ys hire yaf and she is tok. Als God him havede thider sent. He took hers, and she took his. They were married fair and well. As God had him hither sent. This blog has been rather introspective and sober recently, so I think it's time to post something quick and fun. As I mentioned a little while ago, I've been conducting a mini Twitter experiment in my free time: Old English Wisdom. I've been posting daily snippets of proverbs, maxims, and advice or counsel from Old English poetry and prose, with translations, and the account has now acquired more than 1200 followers (and counting). This has been great fun for me, and since an hour's skim-reading of a weekend can yield enough material to keep me going for weeks, it doesn't take up much time at all. I may never get to teach Old English again (to students, I mean - no one can stop me teaching it to 1200 strangers on the internet!) but it gives me such pleasure to have an excuse to re-read all these familiar and less-familiar texts. It's also a pleasure to play with some ways of negotiating the challenges of this kind of project, and to think about how the brand-new medium and the centuries-old message can work together. The biggest challenge, the thing I ponder most, is the lack of context. I'm bit obsessive about context, and one of the challenges of sharing anything on the internet as I do - pictures of manuscripts, extracts from texts, etc. - is working out how to give enough information to provide a full and accurate context, without exhausting the patience of the reader with excessive detail. This is especially acute on Twitter, where you never know how far a tweet may go or who may read it. But it's a useful challenge - it helps me to prioritise, and to think myself into the position of someone who doesn't know anything about texts which are very familiar to me. One of the features of this project which first gave me pause was that the individual tweets are, by necessity, lacking in context (I attribute them with a hashtag, which links tweets from the same texts together over time, and provides context of a sort.) I've only been able to reconcile this with my over-active scholarly conscience by the thought that proverbs and maxims are, by their very nature, statements which can be decontextualised and recontextualised almost without limit. That's how proverbs work, right? You can use them wherever they feel appropriate (or humorously inappropriate). And in the case of Old English maxims, they stand out from their immediate context by certain formal and grammatical features, and we find them across the corpus reused in multiple different contexts, in each of which they function differently. So I think it's acceptable (I hope...) to take them out of their context and let them stand alone, to some extent, in a way it might not be with other types of quotation. The other challenge is translation; Old English poetry is hard to translate at the best of times, and in the case of proverbs and maxims there are even more uncertainties. They can often be translated in multiple ways, all equally possible - I do my best, but I'd be the first to admit that any single translation, especially when confined by Twitter's character limit, is often inadequate. But I think it's worth trying, if it's a choice between that and not posting the texts at all. Ah, but I promised you fun. Some really excellent Anglo-Saxon proverbs are just a little too long for Twitter, and so here are five amusing examples from a collection known as the 'Durham Proverbs'. This group of forty-six proverbs comes from the manuscript Durham Cathedral, MS B. III. 32, images of which you can see here. Despite the name, the manuscript was not made at Durham (it only came there in the eighteenth century) but most likely at Canterbury, and the proverbs were added around the middle of the eleventh century. 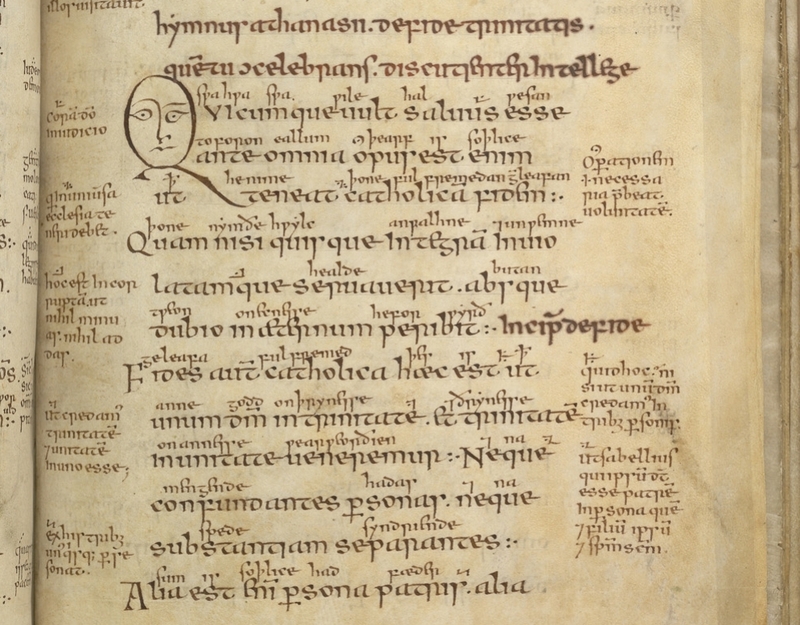 The manuscript also contains this hymn to St Dunstan, among other hymns and canticles, and the proverbs it contains appear in both English and Latin versions. Several have parallels in other Old English poems, including 'The Wanderer', and some appear in later Middle English sources too. Nunc in iudicio porci dixit maritus sedens in apro. Nu hit ys on swines dome, cwæð se ceorl sæt on eoferes hricge. It’s up to the pig now, said the peasant sitting on the boar’s back. [N]eque confiderem liceat bene ambulasset dixit qu[i] uidit [st]rigas capite pregredientes. Ne swa þeah treowde þeah þu teala eode, cwæþ se þe geseah hægtessan æfter heafde geongan. I wouldn’t trust you even if you walked well, said he who saw the witch walking on her head. [N]ec caro carnem emendat dixit qui caccabum plenum ponderosum coxit. Ne saga sagan, cwæð se geseah hwer fulne healena seoþan. Don't tell tales, said he who saw the pot of hydroceles boil. ...ait qui a[udiu]it [clamorem in] infern[o]. Wide ne biþ wel, cwæþ se þe gehyrde on helle hriman. Far and wide things aren't good, said the one who heard wailing in hell. [T]e habe[a]t qui te uocet [ai]t qui famem uidit abeuntem. Age þe, se þe æfter cige, cwæþ se þe geseah hungor of tune faran. He can have you who calls after you, said the one who saw hunger leaving town. 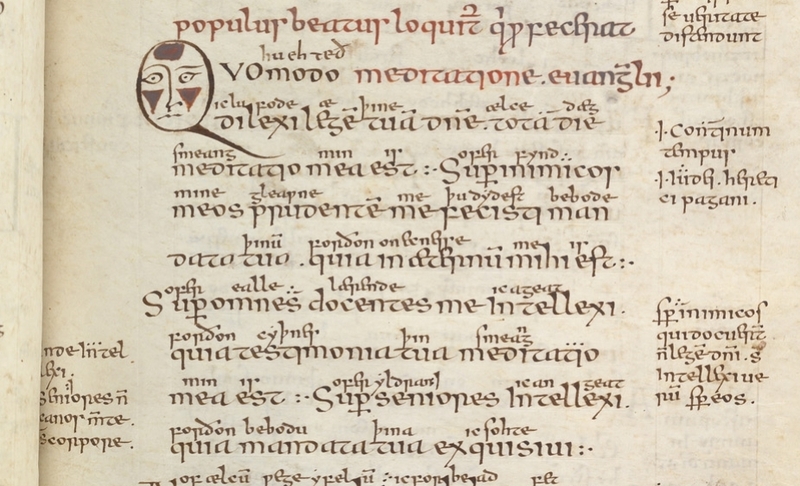 Images: two quirky little faces in a glossed Anglo-Saxon Psalter. Just because. 13 July is the feast of St Mildred, eighth-century abbess of the Kentish monastery of Minster-in-Thanet. Mildred is a fairly minor Anglo-Saxon saint, but she's of particular interest to me for various reasons. I wrote about her story here and about the legends surrounding the foundation of her abbey here; if you want to read about Mildred I recommend you follow those links, because today's will be a more personal post - just a ramble, really, about some things I've recently been thinking about. My interest in Mildred is part scholarly and part personal, and it's not entirely possible to separate the two. First the scholarly. In the eleventh century Mildred's relics and the lands of her former abbey in Thanet came into the possession of St Augustine's, Canterbury (by grant of Cnut, according to St Augustine's tradition); this meant that at the end of the eleventh century the prolific hagiographer Goscelin, among various commissions he undertook for St Augustine's, wrote several works dealing with Mildred. Mildred's relics and cult thus played a role in Cnut's relationship with the English church and in post-Conquest interpretations of the Anglo-Saxon past, two of the subjects I'm most interested in at the moment. As for the personal: I was born in Thanet, one of the few places where Mildred is still commemorated today. 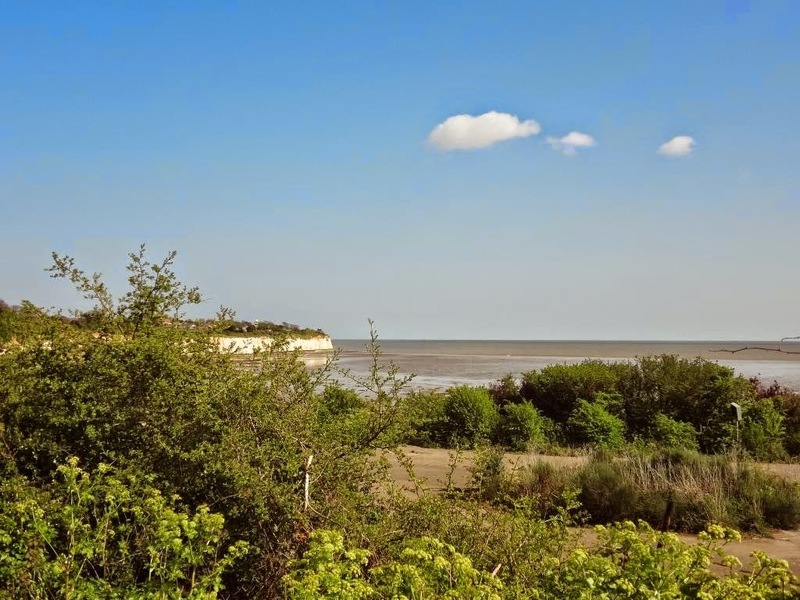 In Mildred's time Thanet was an island close to the north-east tip of Kent; the channel which separated it from the mainland has since silted up, but it's still known as the Isle of Thanet. It's chiefly famous for having once been full of seaside resorts, then becoming very run-down, and now enjoying a bit of a cultural renaissance. When I was growing up there it was still in the 'very run-down' stage of that process, and despite the renaissance it's still often treated as a joke, whose working-class inhabitants can be freely mocked in national newspapers. I'm proud of being from Thanet, but I'm conscious that I don't speak with a Thanet accent, and that if I did, I wouldn't have got very far at Oxford. But long before that story of boom-and-bust-and-boom, Thanet had a rich medieval history, especially in the early Anglo-Saxon period. 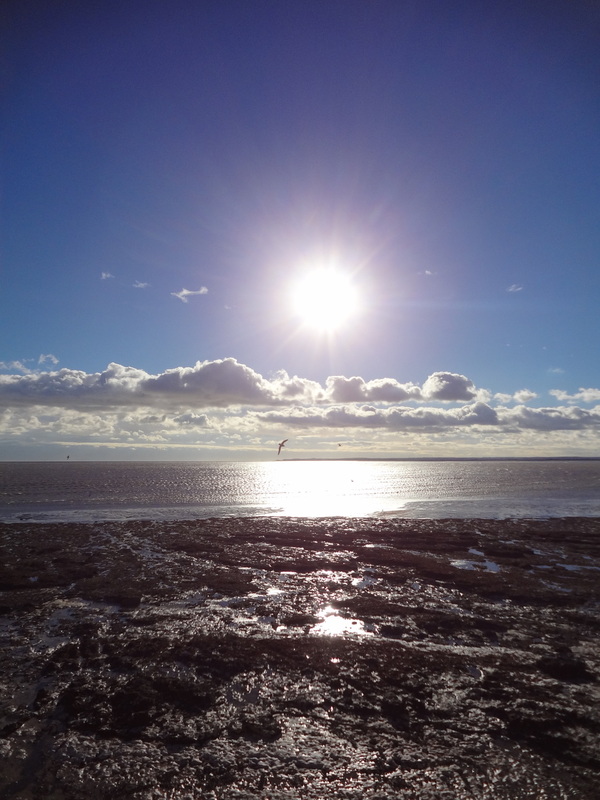 Bede tells us that St Augustine landed on the coast of Thanet when he came to convert the kingdom of Kent, and the foundation of a royal monastery at Minster followed in the seventh century. St Mildred, although herself a rather shadowy figure, is a part of all this. My first school was dedicated to St Mildred - not that I particularly noticed it at the time! - and later, as a graduate student, I spent two years at Lincoln College in Oxford, which was built (as I learned at the end of my time there) on the site of a medieval church dedicated to St Mildred. I graduated with my doctorate on St Mildred's Day, 2013 (entirely by coincidence - it was the only date available). So her home and her name and her day have a range of personal associations for me which have very little to do with Mildred herself. I can't say how far the personal inspired the scholarly interest, or the other way around - perhaps I was drawn to Mildred because I'm from Thanet, or perhaps studying Mildred has made me more interested in Thanet's Saxon history, which I didn't really know about or think about when I actually lived there. It's probably a bit of both. Who can explain why they're drawn to the subject they study? I suspect more academics than would freely admit it have private, personal reasons for their scholarly interests which wouldn't stand up to professional scrutiny, alongside the more publicly acceptable ones. We are human beings, after all, and are attracted to certain things by influences we ourselves don't necessarily understand. Struggling as I am with work and vocation right now, I sometimes think it would be nice if more people (not just academics) felt free to talk about what draws them to the work they do. Over the past few months, as people keep asking me to explain why I write an academic blog, I've come to realise that one reason is to convince myself that it's OK to have a personal, emotional attachment to the things I study. It's even OK to talk in the language of enthusiasm, passion and (dare I say it?) love. Like everybody who isn't senior enough to get away with looking unprofessional, I strictly keep emotional attachment out of my academic work, but I don't feel I have to do that on this blog - and I think the blog is the better for it, and I'm the healthier. I'm encouraged in this belief by the knowledge that the medieval historians I study generally saw no problem whatsoever in being emotionally attached to their subjects. I like them all the more for it, and when I talk about them to the public, it's that which catches people's attention. As someone whose interests are primarily literary (I'm interested in the stories people tell about history, not in whether those stories are true or not), I find it endearing when medieval historians are biased and parochial and a little bit obsessive - all the things 'monkish writers' used to be criticised for by modern historians of the traditional stamp. Nothing makes me like William of Malmesbury more than his special fondness for Malmesbury's history, the fact that he can't resist being a bit extra interested in Aldhelm and Athelstan and anything connected to his own monastery. I love the thought of Eadmer at the Council of Bari, surrounded by the great and the good of the eleventh-century church but still getting most excited about a minor tidbit of local Canterbury history and the memory of some old monks he knew as a child. And there's something touching about the way Goscelin talks about St Edith of Wilton as if she were a personal friend, and associates her with a lost happy period in his life. 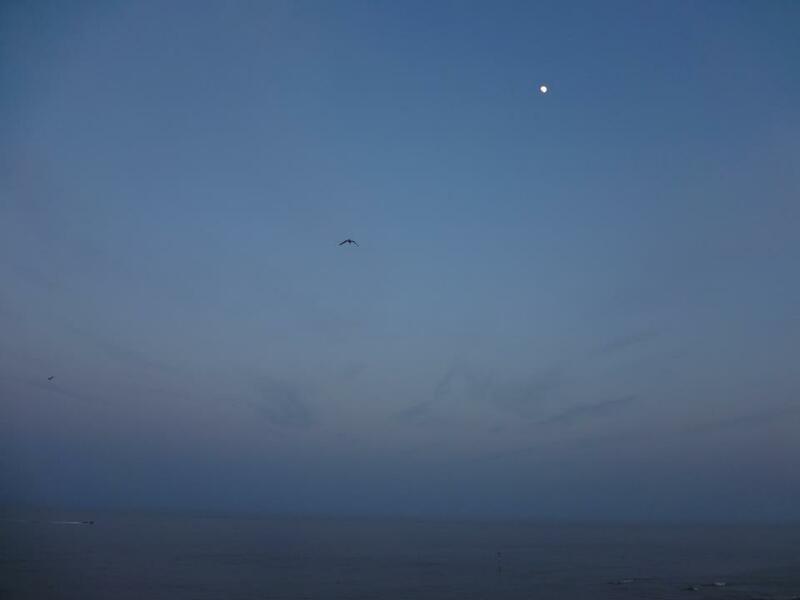 These are emotional responses to the past which have little to do with the facts of history, and much to do with each writer's personal associations with a saint and the relationships, identities, or communities they represent for the writer. They're entirely 'unprofessional' reactions, from the best English historians of their day, of a kind which few historians now would admit to in public even if they felt them. I think about this question quite often, especially as social media increasingly allows scholars to have a more open approach to displays of personal enthusiasm than is acceptable in a traditional academic environment. (Even if some will still squeak 'Oh no, enthusiasm!') What do we attach ourselves to, and why? These days academics, like many people, are encouraged or forced to live rootless lives, changing jobs often and not developing an attachment to any particular institution. There are few places we have time to know intimately and few communities of which we can become a permanent part. I'm unusual for an early-career academic in that I've been in Oxford for years now, although never in a permanent position or anything like a home - it's been stints of two- or three-year affiliations, while living in different types of rented accommodation (eight places in ten years). Even that precarious form of stability is a black mark against me in the job market (everything's a black mark against you in the job market! ); and if I wanted to get another academic job I'd have to be prepared to leave at the drop of a hat, whatever that meant leaving behind. That's a choice everyone has to make for themselves, of course, and one always has the option to opt out. But I wonder if it grows increasingly hard for people like me to understand what it might be like to count on living in one place your whole life - for instance, what it might be like for a monk or nun to spend his or her entire life attached to one monastery, living its communal life day after day in the physical presence of its saints and former inhabitants. Not that monks and nuns didn't travel, of course - and away from home, home associations pull most strongly. The three writers I mentioned above illustrate this, too: William of Malmesbury travelled around on research trips, Eadmer spent years in exile with St Anselm, and Goscelin, a kind of itinerant hagiographer who worked on commission, could almost be the patron saint of academics on contingent, short-term contracts. And anyway these monks would all have said that no one gets to have a permanent home in this world: Non enim habemus hic manentem civitatem, sed futuram inquirimus, however much we may love the temporary homes we do find in this læne lif. But I think that one reason I am drawn to studying monastic communities is that they offer a rootedness which seems impossible today - at least for people like me. The idea of settling down, finding a home, knowing you can live and work in the same place for decades if you want to - these are things people of my generation are told not to expect or hope for (by people who were able to do just that, of course), and it is difficult, even if we try to believe it's fun and exciting to be adrift in the world. I crave a sense of rootedness and belonging and if I project that feeling of security here on this blog, as people sometimes tell me I do, it's because I'm working hard to find it for myself where circumstances don't provide it for me. 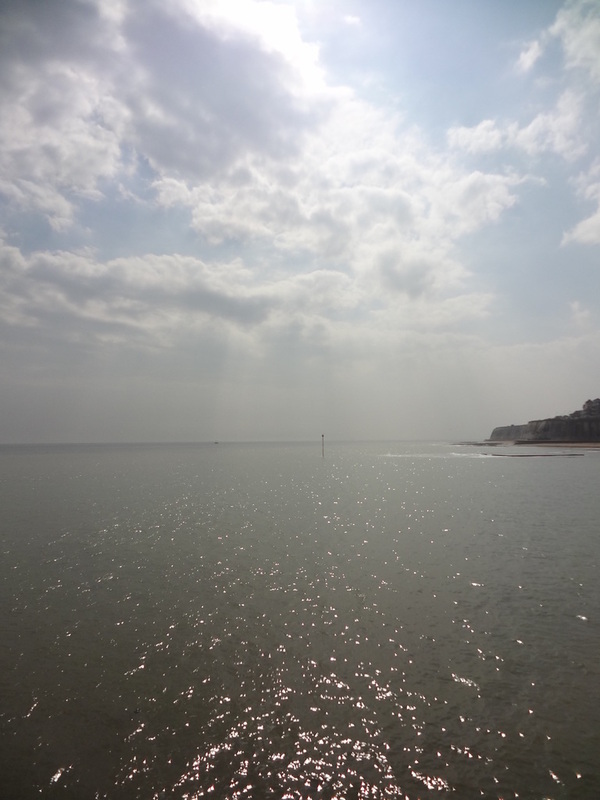 One place I find it is in treasuring the roots I have in a small, unpicturesque island in the most out-of-the-way corner of Kent, and in tracing how disparate elements of my life have accidentally found common ground in an association with St Mildred. Mildred's Thanet looked very different from mine - no seaside resorts in her day - but much would have been the same: the huge skies, the noisy seagulls, the yellow beaches, the white cliffs, the great flat fields stretching out to the sea. 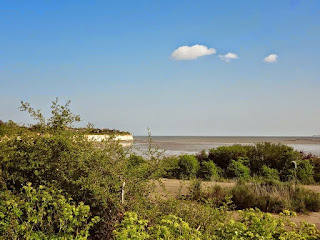 Many features of the island were ancient even when Mildred lived in Thanet, from Bronze Age barrows to Roman walls and the very name of the place; they'd grown older still by the time I was born there, 1300 years after Mildred's foot stepped onto Thanet's shore and left its miraculous imprint. 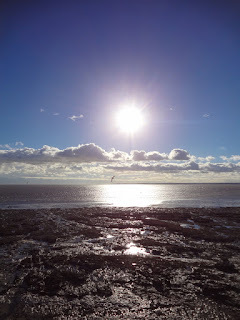 There's no substitute for this kind of intimate connection with a place, and it teaches you things even as you don't realise it. I get most of my knowledge from books, of course, but I've found that one unexpected advantage of talking about my work publicly is that it brings me into contact with people who have that kind of love and knowledge for the places I study. They can correct me or give me hints I couldn't have found otherwise (the third comment on this post is an example I remember fondly). We can go astray in many ways when we get our knowledge only from books, and I've been noting one tiny example of this lately, especially at international conferences: perceptions of distance. To people studying an area by looking at it on a map, things often seem much closer together than they do if you're there – and it's easy to make airy statements about distance which just don't ring true if you know the landscape. I've fallen into this trap myself, and heard others do so when talking about places I know well. I remember reading a journal article once where the argument went something like: 'Canterbury is near London, so monks in Canterbury would have felt a special connection with the saints of St Paul's'. This is a shaky argument for various reasons but what especially pulled me up short was the idea of Canterbury being 'near' London - I mean, of course it is in one sense, on a global scale, and by the standards of US cities, but it certainly doesn't feel so. Now that we in deepest Kent have high-speed trains, you can get between Canterbury and London in less than an hour, but even today I wouldn't say it was 'near' in the way that author meant, such that an inhabitant of Canterbury would feel London's saints to be their own 'local' possessions. Canterbury has enough of its own medieval history to be proud of, I told the author crossly in my head, without piggybacking on London's! (Then I felt silly; but I'd bet you any medieval Canterbury historian would have said the same...) Or, when talking about Mildred's relics, academics sometimes say they were moved from Thanet to 'nearby Canterbury' or 'nearby Lyminge' – Canterbury I'll allow to be 'near' (though it probably felt a bit further away when Thanet was a real island), but try and get from Thanet to Lyminge, even today, even by car, and see whether you would say it was 'nearby'! 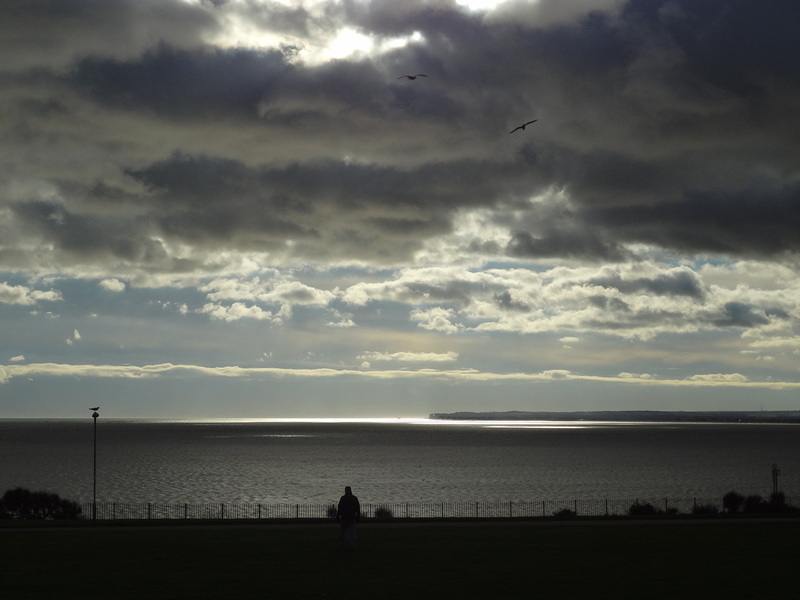 Thanet is on the very edge of England, closer to France than to London, and on a grey day in January with the mist over the sea it feels like the edge of the world. 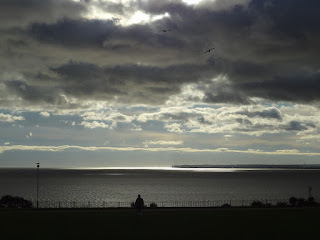 Even the other end of Kent is very far away. Did it feel the same 1300 years ago? I can't know for sure, but I can be a bit more confident than if I had never known the place; and that only makes me more aware of how much I don't know about other places, other experiences, other lives than the one I have lived, and how much there is to learn. So I'm not saying any of this to nitpick anyone else's work; obviously people don't and shouldn't only work on subjects of which they have personal experience, and I know I've made similar errors when talking about areas I'm not familiar with. (I'd written quite a bit in my thesis about Ely and the Fens before I visited the area, and as soon as I got there I felt I hadn't really understood the place at all.) But these are things we can learn from the places themselves and the people who live in them, and it does pay to be mindful about such things. If you don't walk the landscape and you don't live the life, you should at least be prepared to listen to people who do. It's about perception and perspective, not maps and facts - and this applies to more intangible matters as well. I gave a public lecture earlier this year which was partly about Mildred, and in the audience were two nuns from her own monastery, Minster-in-Thanet. This was incredibly humbling. I was supposedly the 'expert' in the room, and the nuns were very friendly and enthusiastic and said I'd told them things about Mildred that they hadn't known; but although in some ways they knew less about Mildred than I do, in other ways they knew much, much more – living in her monastery (on the same spot and in some of the very same buildings) and living the life she lived, they knew her in a way I could never fully understand. Perhaps that's a rather unusual example, but I ponder this sometimes when thinking about the difference between the lives I study and the life I live, and about public engagement. Being prepared to listen to other people's experiences is one of the many ways in which public engagement can enrich academic study - and here I come back to my medieval historians. We could think of medieval saints' cults as a form of public engagement, in which an educated person with a scholarly interest in a particular historical figure - but probably also a personal investment in promoting that figure to the public - attempts to mediate a historical story in a way attractive to a whole range of audiences, talking about the past to people who might know very little about history, and who have their own intensely personal reasons for being interested in the subject. (Because they want a cure, or a local hero, or to prove someone wrong, or they don't like the monastery, or whatever it might be.) Accounts of saints' miracles are very rich social pictures, offering glimpses at many kinds of human experience - from sick little children with their worried parents to vulnerable elderly people with carers at the end of their tether, they tell stories of the ill and the dying, the proud and the frightened, the faithful and the sceptical, from all classes. Read enough of these and you see the generic patterns, but they are also at the same time unique, local, and specific. These narratives are scattered with place-names which would mean a great deal to a local audience and nothing to one further afield. For example, here's a list of some of the people whose stories are told in the first few Miracles of St Waltheof, which I happen to have to hand: a blind man from Luddington; a sick woman from Sleaford; a little girl from Stretton; a mentally disturbed boy from Whaplode; a blind woman from Skirbeck; and so on. The monk of Crowland Abbey making a note of Waltheof's miracles recorded the names and homes and afflictions of all these people who had come to seek a cure from the saint, and the list is geographically restricted (those places are mostly in Lincolnshire and the surrounding counties) but diverse in every other way. It's easy to think of scholarly monks as proto-academics - but if this was the range of people with whom a medieval English monk was interacting, was his experience really more restricted and narrow than life in academia, where scholars principally get together with other scholars from similar backgrounds and panic at the idea of talking to the public? Among all the other things it is, medieval hagiography is local history, and that's one of the things which makes it easy to write about for a popular audience. You'd think nothing would be less accessible to a modern audience than stories of medieval saints (especially since I tell them fairly seriously, not in a 'here are some funny stories about weird miracles' way) - but when I post about such stories they touch people on a personal level, and I find that moving. When I look at the people who respond to my posts about saints here and on Twitter, there's always a strong local element, and it often seems to be people without any other obvious interest in medieval history who will say with most excitement 'oh, a story about my area'! I watch my links spreading through local networks of businesses, schools, churches and enthusiastic individuals: Norfolk networks love the Norfolk saints, Kentish networks seize on the Kentish saints, London networks are proud of the London saints, and so on. Place-names like those in the list above, which don't mean much to me, are to some people a word for 'home', and a part of their own personal history, as Mildred and Thanet are to me. It feels like a privilege to give people the chance to get these little footholds of personal connection to the past. It would be best, of course, if such a diversity of experiences could be represented within academia itself, but as routes into the profession drastically constrict the less possible that seems. As I watch my postdoc friends quietly leaving academia, it seems to me it's not just talent which is lost but that very diversity: those who leave are the people who can't live rootless lives, because they have (and believe it's important to have) children, parents, and partners to think about; or the people who appear less 'professional' by academic standards (too working-class, too female, that kind of thing); or the people who don't come from backgrounds where constant rejection and job instability are things you just shrug off. The more academia becomes the preserve of people who are able - financially, practically or emotionally - to move countries every few years and to support themselves through extended periods of part-time work, the more socially and psychologically narrow a world it will become, the more detached from the wide range of human experience it claims to be able to classify and explain. That's one reason why it needs to listen to the public, as much as the other way around. That's partly why I'm prepared to 'do history in public' in a personal way, and to talk here about my own experiences and my love for various authors and texts, even though I fear - quite a lot, actually - that it will come across as silly and unprofessional. I admit freely that my attachment to Mildred is utterly irrational, and not a bit diminished by the fact that most of what we know about her is 'just' legend. Even if she had never existed, never been more than a name, that name and her story would still represent a part of my life, a part of me: a connection to my own history, the institutions I've been a member of, the people I knew and loved there. Those things matter to me immeasurably, and they will remain with me whatever happens to my academic career. What I do on this blog (I've recently learned) is considered 'public history', but it doesn't feel that way; it feels like thousands of private histories, which interact and intersect and enrich each other. And mine is one among them. 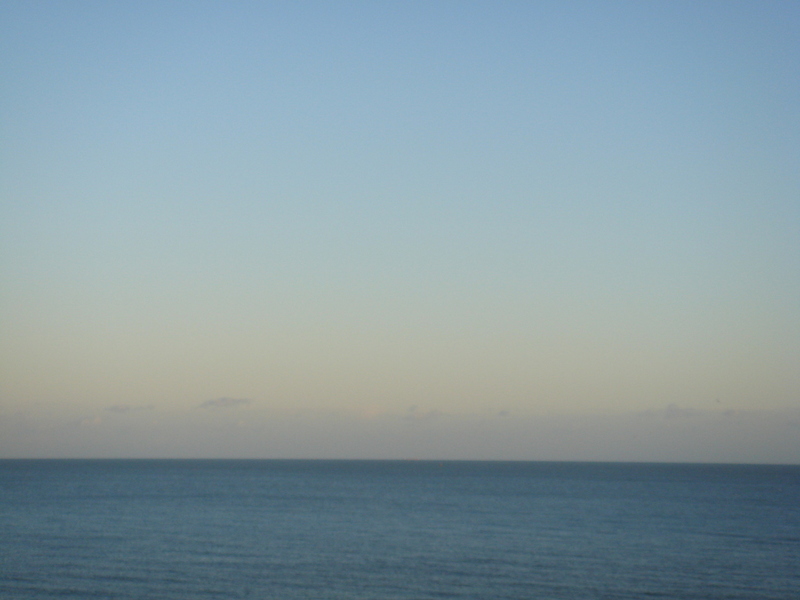 All the pictures in this post are of Thanet's fathomless skies. I was amazed and delighted this morning to discover an article about my blog (specifically this post about Ælfric's homily on the death of St Benedict) in the Telegraph. I've been reading Christopher Howse's column since I was a teenager, and it's long been a kind of model for me in how to write clearly, lyrically, and sensitively about the past - so this really was a thrill. Anyone who has come here today on that recommendation, you're very welcome! Here are some links you might find helpful. 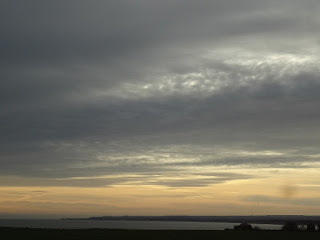 This post explains why and how I blog about medieval texts; I do so in the hope of offering a glimpse at the richness and diversity of England's medieval literature and the many ways it can still delight, amuse, teach and guide. 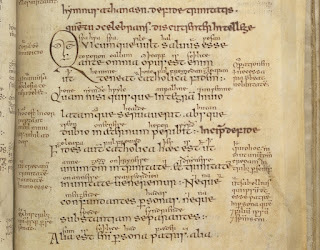 More extracts from the writings of the incomparable tenth-century homilist Ælfric can be found under this tag - representing just a tiny fraction of the work of this incredibly prolific, thoughtful and generous teacher and lucid writer of English prose. Here's a collection of links to posts about Anglo-Saxon literature exploring the cycle of the year, and here's more on the stories of medieval saints from Benedict to Dunstan, Edmund, Anselm, Etheldreda, and more. I hope you find something to interest you! 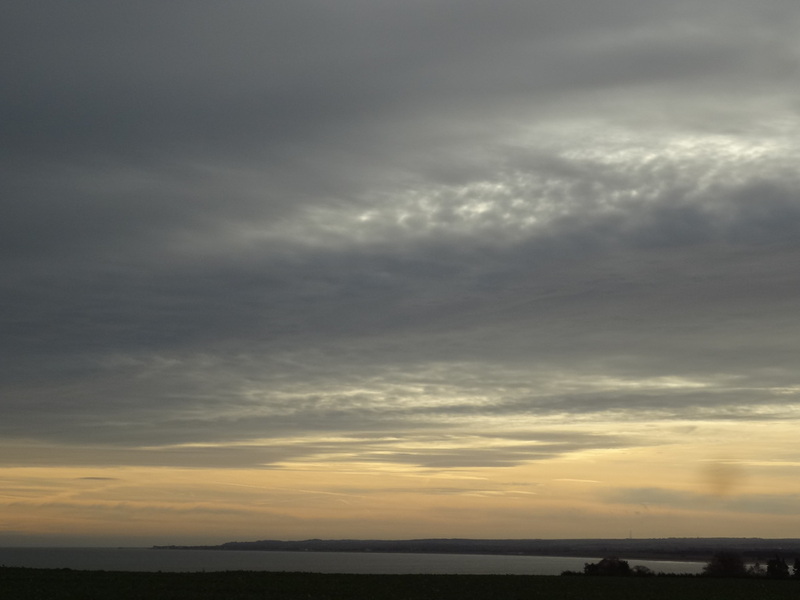 Two years ago, I began a series of posts marking - in real time, as far as possible - the 1000th anniversary of the Danish Conquest of England. This was a lengthy struggle, which resulted in the Danish king Cnut driving the English royal family into exile and ruling England from 1016-1035. During those decades England was part of a great pan-Scandinavian empire, but this period in English history is relatively little known, especially by comparison with the Norman Conquest which took place half a century later. I considered some reasons why that might be so here. This series of posts is an attempt to trace the long and fascinating story of battles, invasions, shifting allegiances, murders, marriages, and betrayals, as recorded in the history and poetry of the time. Links to all the posts in the series so far can be found here. If you're new to my blog, you may not have been aware of this series, because it's been more than a year since the last installment - not because I forgot about the project (honest) but because there was a long hiatus in hostilities between the spring of 1014 and the summer of 1015. Let's recap: Svein Forkbeard, king of Denmark, invaded England in the summer of 1013, after a targeted and swift-moving campaign which involved making alliances with some key players among the English nobility. (This will become important in a moment.) By the end of the year Svein had driven the English king, Æthelred, into exile. But Svein's reign in England lasted less than two months: he died suddenly in February 1014, and Æthelred returned from exile, making a bargain with the witan that he would rule England more justly than he had before. Within a few months he had managed to force the Danish army, now led by Svein's young son Cnut, back to Denmark. Last summer, we saw Cnut sailing away with a final gesture of unpleasant defiance: returning the English hostages who had been given to his father with their hands, ears and noses cut off. A number of Danish ships under the command of the formidable Viking leader Thorkell the Tall stayed in England, still taking large payments of money from Æthelred, but apparently not giving their full allegiance to either the English or the Danish king. Between Michaelmas 1014 and the summer of 1015, the Anglo-Saxon Chronicle, our most detailed narrative source, doesn't tell us what was going on in England. The gap itself is interesting. One of the advantages of this kind of real-time project, attempting to follow events more or less in the sequence that they happened, is that you are forced to notice gaps and pauses as much as events, the absence as well as the presence of information. Writing a narrative of any historical period, we mostly have little choice but to skip over the times for which we don't have any details; but a year is a long time, and a lot can happen. What was Æthelred doing? Was he consolidating his position, 'ruling more justly than before'? Was he holding fire on his internal enemies, waiting to strike? We can't really know. On þissum geare wæs þæt mycele gemot on Oxonaforda. 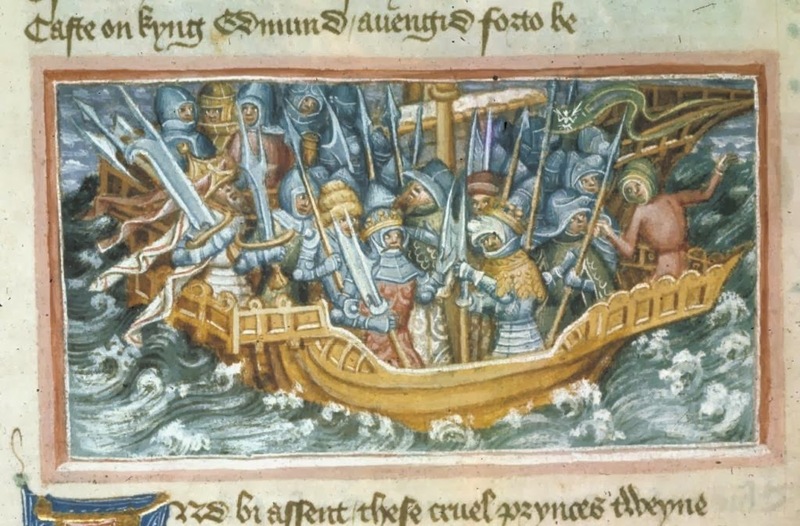 7 þær Eadric ealdorman beswac Sigeferð 7 Morcær þa yldestan þægenas into Seofonburgum. bepæhte hi into his bure. 7 hi man þær inne ofsloh ungerisenlice. 7 se cyng þa genam eall heora æhta. 7 het nimon Sigeferðes lafe 7 gebringon binnon Mealdelmes byrig. Þa æfter litlum fece ferde Eadmund æðeling to. 7 genam þæt wif ofer þes cynges willan. 7 heafde him to wife. Ða toforan natiuitas sancte Mariæ ferde se æðeling wæston norð into Fifburgum. 7 gerad sona ealle Sigeferðes are 7 Morcares. 7 þæt folc eall him tobeah. This is the English aristocracy in chaos. 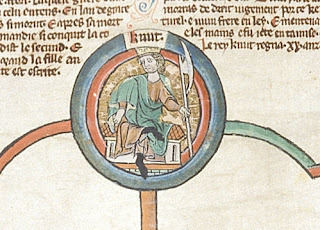 A 'great assembly' held at Oxford was probably an attempt at peace-keeping, reunification of Æthelred's kingdom after it had fallen piecemeal (and not always reluctantly) to the Danes two years before. 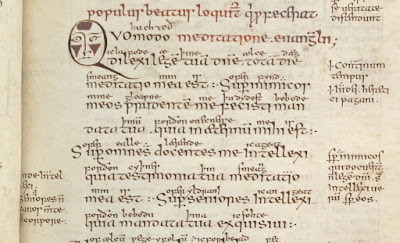 In the Anglo-Saxon period Oxford was (strange as it is to think of!) border-territory, on the frontier between Wessex and Mercia - formerly independent kingdoms, all part of 'England' by the eleventh century, but ruled by different interests and with some sense of regional identity, nonetheless. Lying at the meeting-place of roads and rivers, Oxford was a key strategic location; two years earlier, it had been the first town in the south to submit to Svein, by force, after the north had declared allegiance to him. Perhaps the assembly of 1015 was held in Oxford as a kind of neutral territory, a symbolic gesture to bring the north and south together in a reunited country under the restored king. But it didn't work out that way. 'Eadric the ealdorman', better known as Eadric streona, was one of Æthelred's closest advisors, and he may well have been acting on the king's orders when he secretly and treacherously murdered Sigeferth and Morcar, the most powerful thegns in the Midlands (they ruled a territory based around the 'Five Boroughs' of Lincoln, Derby, Leicester, Nottingham, and Stamford). In 1013 the Five Boroughs had submitted to Svein very quickly, and Sigeferth and Morcar had not only led the submission to the Danes but probably arranged for their kinswoman Ælfgifu of Northampton to marry Cnut. After this defection it seems that Æthelred did not trust them, and perhaps this summary killing at the Oxford assembly was delayed punishment for their rejection of the English king - who had promised on his return that he would 'forgive all injuries against him', and didn't. To murder anyone under the guise of hospitality in this way was a particularly shocking act. Æthelred may have rid himself of two potential enemies, but he created another, and a more dangerous: his own son, Edmund Ironside, who now openly rebelled against his father. Edmund married Sigeferth's widow and reclaimed the territory of the murdered thegns from the king, building himself a power-base in the Midlands. 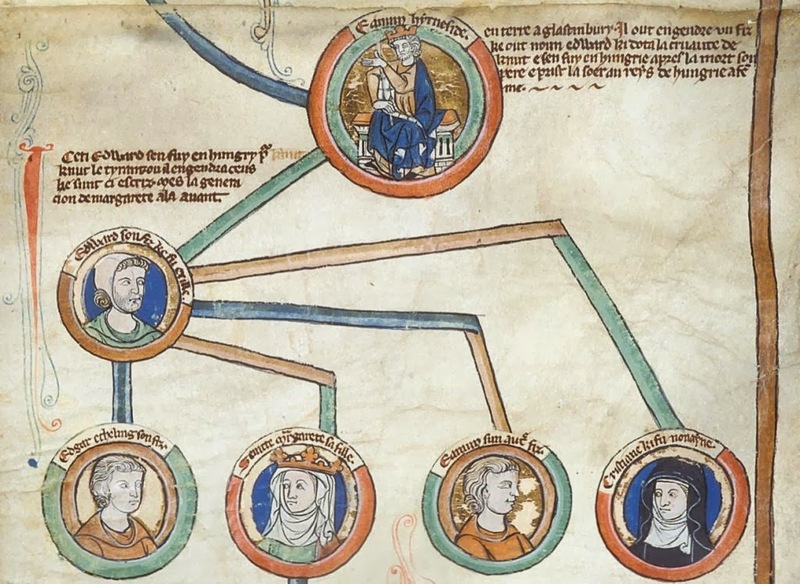 Sigeferth and Morcar may have been Edmund's friends and allies - they had apparently been close to his brother Æthelstan, who had recently died and left them bequests in his will. 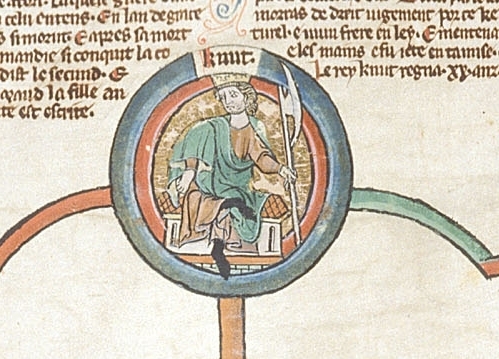 After the early death of his elder brother in 1014, Edmund was Æthelred's oldest surviving son and the person best placed to inherit the throne. This break between the king and the atheling was a serious crisis. Sigeferth's widow, the woman here seized and imprisoned and taken and married ('against the king's will' - was it against hers?) is named by a later source as Ealdgyth. 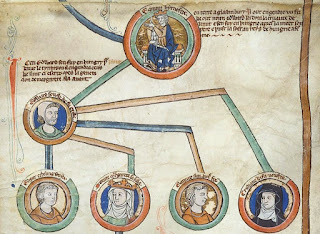 We know nothing more about her, but she was probably the mother of Edmund Ironside's two sons, who spent almost all their short lives in exile after fleeing England in 1016; but one of them was the father of St Margaret of Scotland, through whose descendents the line of the Anglo-Saxon kings was grafted back into the royal family tree after the Norman Conquest. So this marriage, hasty and controversial as it was, may have left a long legacy. The summer sun was drawing near, and Knutr, having restored the army, hastened to return and avenge his injuries. 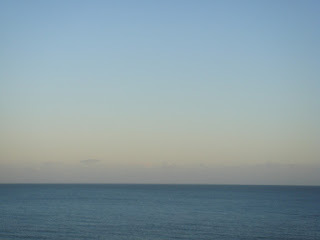 But as he was strolling round the beaches, he observed a small number of ships out at sea. For Thorkell, remembering what he had done to Sveinn, and that he had also unadvisedly remained in the country without the leave of Knutr, his lord, sought his lord with nine ships and their crews, in order to make it clear to him that he was not acting against his safety in remaining, when he went away. When he arrived, he did not presume to approach the shore unbidden, but casting anchor, he sent messengers, and asked leave to enter the ports. When this was granted, he landed and asked his lord's mercy, and having become with great difficulty reconciled to him, he gave an oath of fidelity, to the effect that he would serve him continuously and faithfully. He remained with him more than a whole month, and urged him to return to England, saying that he could easily overcome people whose country was known far and wide to both of them. In particular, he said that he had left thirty ships in England with a most faithful army, who would receive them with honour when they came, and would conduct them through the whole extent of the country. Encomium Emmae Reginae, ed. and trans. Alistair Campbell (London: Royal Historical Society, 1949), p. 19. Then the king said farewell to his mother and brother, and returned to the area of the winding coast, where he had already assembled the fair spectacle of two hundred ships. For here was so great a quantity of arms, that one of those ships would have very abundantly supplied weapons, if they had been lacking to all the rest. Furthermore, there were there so many kinds of shields, that you would have believed that troops of all nations were present. So great, also, was the ornamentation of the ships, that the eyes of the beholders were dazzled, and to those looking from afar they seemed of flame rather than of wood. For if at any time the sun cast the splendour of its rays among them, the flashing of arms shone in one place, in another the flame of suspended shields. Gold shone on the prows, silver also flashed on the variously shaped ships. So great, in fact, was the magnificence of the fleet, that if its lord had desired to conquer any people, the ships alone would have terrified the enemy, before the warriors whom they carried joined battle at all. For who could look upon the lions of the foe, terrible with the brightness of gold, who upon the men of metal, menacing with golden face, who upon the dragons burning with pure gold, who upon the bulls on the ships threatening death, their horns shining with gold, without feeling any fear for the king of such a force? 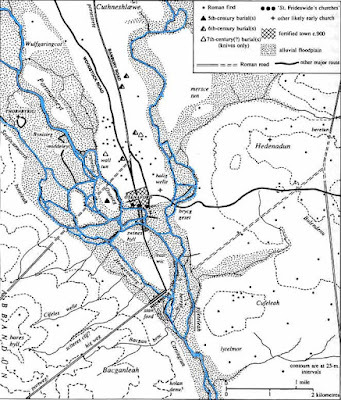 Furthermore, in this great expedition there was present no slave, no man freed from slavery, no low-born man, no man weakened by age; for all were noble, all strong with the might of mature age, all sufficiently fit for any type of fighting, all of such great fleetness, that they scorned the speed of horsemen. And so the force which has been described, having unfastened the anchors and ropes from the shore, boarded the lofty ships and put to sea, and swept the waves with such impetus, that you would have thought that they were flying over the water in winged ships, which hardly creaked, heavy as the sea was. Encomium Emmae Reginae, trans. Campbell, pp. 19-21. 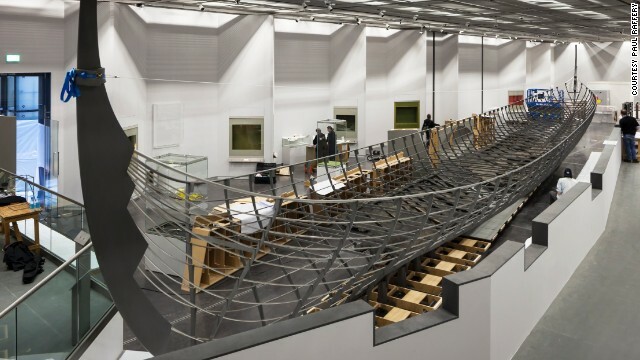 There's poetic licence here, but perhaps not too much; anyone who marvelled at the huge reconstructed ship in the British Museum's recent Vikings exhibition can imagine how impressive Cnut's fleet must have been. þitt nafn - í haf stafna. Óttarr svarti, Knútsdrápa, ed. 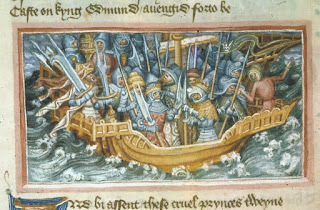 Matthew Townend, in Diana Whaley, ed., Poetry from the Kings' Sagas 1, Skaldic Poetry of the Scandinavian Middle Ages I (Turnhout: Brepols, 2012), Part 2, p.
Sea-chariot's destroyer, you launched ships at a young age; no younger ruler than you, O warrior, ever set out from home! Prince, you prepared hard-armoured ships, and were wondrously brave; in your rage, Cnut, you raised red shields before the land... Captain, the sail billowed above you; many prows you sent west across the sea. Thus you made your name known! In the next post, we'll see what happened when those ships reached land. But as a foretaste, here's an extract from another poem composed for Cnut, this time by Sigvatr Þórðarson - this is what Æthelred and Edmund Ironside had to look forward to. Sigvatr Þórðarson, Knútsdrápa, ed. Matthew Townend in Whaley, Poetry from the Kings' Sagas 1, pp. 651-2. And Ivar, who dwelt at York, had Ælla's back cut with an eagle; and Cnut soon struck down or drove out the sons of Æthelred, every single one. This is a reference to one of the most famous Vikings of them all: Ivar 'the Boneless', son of Ragnar Lothbrok. In compliment to Cnut, the poet Sigvatr here brings together two Danish triumphs over English kings which took place almost exactly 150 years apart. In 867 Ivar and his brothers killed Ælla, king of Northumbria, and conquered northern England - a famous victory, and even in the eleventh century the stuff of evocative legend. Ivar's was a name to conjure with, a great Viking predecessor for a young Danish king to follow. Ivar and his brother were most famous in English history as the killers of St Edmund of East Anglia - and in 1015 St Edmund's namesake, Edmund Ironside, was about to encounter the Vikings for the first time.